400-pax ferries for San Francisco. 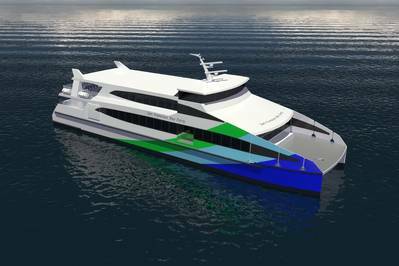 Incat Crowther is designing a pair of 41m catamaran passenger ferries for WETA of San Francisco. The design of the vessels, which will be built by Kvichak Marine Industries, showcase Incat Crowther’s ability to analyze, dissect and meet a set of requirements. The vessel features an isolated cabin, to be built under subcontract by Nichols Brothers Boat Builders, and carries 400 passengers. The layout of the cabin responds to stringent requirements for seating configuration, with a mix of forward facing and booth seats, with and without tables. The elevated wheelhouse offers excellent visibility, meeting operational requirements. In responding to the tender, the team worked hard to offer improvements is passenger flow, snack bar functionality and utility space. Ticket counters on each passenger deck are located in a manner as to not obstruct passenger ingress, improving turnaround times. Large midship boarding doors combine with aft gates to allow quick boarding and disembarkation. The aft gates lead directly to the large aft bicycle storage area. Forward of this is an amenities area featuring 3 toilets (two of which are fully ADA-compliant) and the snack bar. An extra-wide internal staircase leads from here to the upper deck, further aiding passenger flow. Incat Crowther collaborated with Kvichak Marine Industries and Nichol Brothers Boat Builders in 2007 to successfully produce a quartet of ferries for WETA. Gemini, Taurus, Scorpio and Pisces remain among the world’s most environmentally-friendly ferries, and the new vessels will build on this with greater efficiency from their improved hull form and the use of the latest in Selective Catalytic Reduction technology. Fitted with a pair of MTU 12V4000 main engines producing 1453kW each, the vessel will have a service speed of 27knots. The vessel exceeds stringent wake wash requirements set out in the tender. Incat Crowther’s wealth of experience with public sector operators equipped the bid team to propose the optimum vessel.